The Government established the Award in 1985 with the President as patron. In 1986 the President's Award was extended from five pilot areas to the 26 counties. Annually there are over 20,000 new participants attempting to achieve the Award. It is the only National Challenge Award from the President of Ireland to young people between the age of 15 years and 25 years of age. To contribute to the development of all young people through the achievement of personal challenges. Each student has the opportunity to design his/her own programme and the programme can be tailored to suit personal circumstances, choices and local provision. Each level of the Award demands a more increasing engagement from the student in terms of time commitment and responsibility from the participant. The Award also provides a balanced framework to develop the individual's mind and body and community spirit by engaging in a range over the four different challenge areas. It also encourages students to exceed their expectations and achieve their personal best. In order to achieve the Award the participant must work for 1 hour in a Community based activity for 13 weeks, also participate in a Personal skill for 13 weeks and complete a form of Physical Activity for thirteen weeks. The student has the option of selecting one of the activities for a further 13 weeks. Finally the participant must, prepare and undertake a 2 day, 1 night Adventure Journey involving a 25 Kilometre hike at an Adventure Centre. To satisfy the requirement for the Silver Award, the participant must complete a challenge for 26 weeks in the following: Community Involvement, Personal Skill and Physical Recreation. The participant selects one of the three activities and completes 26 weeks of additional time if he/she is a direct entrant and hasn't completed the Bronze Award. The participant must complete a challenge for 52 weeks in the following:community Involvement, Personal Skill and Physical Recreation. The participant is also required to select 1 of the activities for 26 weeks of additional time if he or she is a direct entrant. The participant must also plan, prepare and undertake a 4 day, 3 night Adventure Journey. Each of activities selected require 1 hour of participation per week. 1. The participant improves self-belief and confidence. 2. 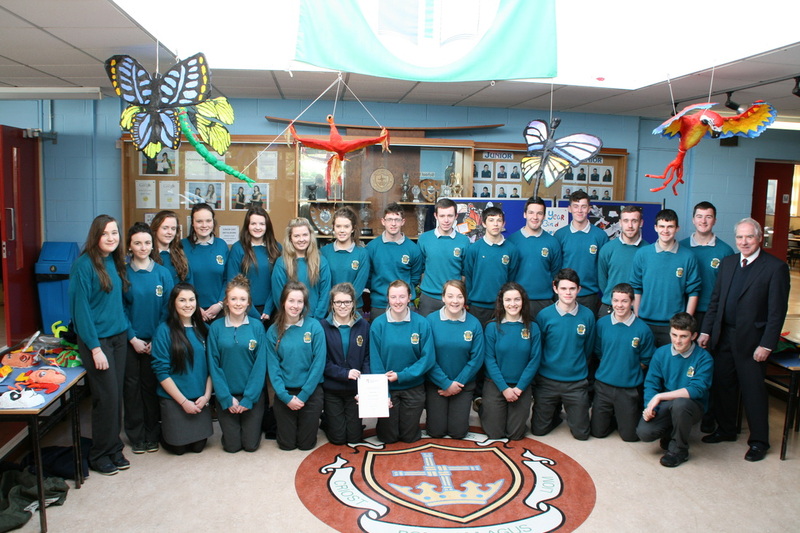 Students who achieve their Gaisce Award develop an independent and self-motivating attitude. 3.The students also develop a sense of responsibility to others. 4. It helps participants to connect to the broader society. 5. Students develop new and improved interests. 6. Participants also develop a willingness to try new things. 7. Students develop a new set of life-long interests and skills. "You are not comparing yourself with anyone, you are not competing with anyone, what you are actually doing is creating yourself." JK Rowling addressing Harvard graduates makes the point beautifully. Standing L-R Back Row Mr Coughlan (Deputy Principal) Anita Conroy, Jason Doerflinger, Aaron Mannion, David Lynch, Niall Duane, Olgierd Olozowy, Cathal Quirke. Row 2 Mark Keane, Eoin Gohery, Cian Robinson, Michael Dolan, Niall Darcy, Karen Mullery, Laoise Larkin, Cliona Ryan, Eric Flaherty, Jason Madden, Laura Woods, Emer Donnellan, Mairead O’Meara, Clodagh McDonagh. Front Row: Cian Gallagher, Kian Porter, Anthony Callagy, Shane Scully, George Harding, Michelle Mitchell, Anna Kelly, Danielle Devery, Evelyn Kennedy, Aislinge Downey, Irin Hague, Helena Horrigan and Shauna McEvoy. The entire cohort of Transition Year students at Portumna Community School have taken on the challenge of the Gaisce Bronze Award. The students will dedicate themselves over the next six months to a range of exciting activities and pursuits. Community Involvement, Personal Skill, Physical Recreation and Adventurous Pursuits. 1. Students need to agree suitable activities for the challenge with the pal before they apply. 3. Click on the award being applied for, then you click on, "read more" then click on "apply now" and follow the application process. 4. During the application process, you will be asked to set a user name and a password. 5. During the application process, enter your personal details, the activities you have agreed with the Pal, together with a start date. 6. Please enter you name using capital letters, for example Mary Irwin; if you use small case letters for your name; this is what Gaisce will print on your Bronze Certificate. 7. You will then be asked for the name of the operating body and the name of the Pal before applying. 8. You will choose the operating body, the Pal and method of payment from three drop down menus. 9. Make sure that you print off a record sheet from the home page (downloads). 10. Get a signature from your supervisor every time you attend an agreed weekly activity. 11. Keep the record sheet safely which is a requirement because you may be asked to produce it if we as a school have an audit from Gaisce. 12. You can also use the on line diary entries. 13. If you have used small case letters, please edit your personal details. We are all delighted with twenty eight Gaisce Bronze Awards at Portumna Community School from Transition Year 2014-2015. 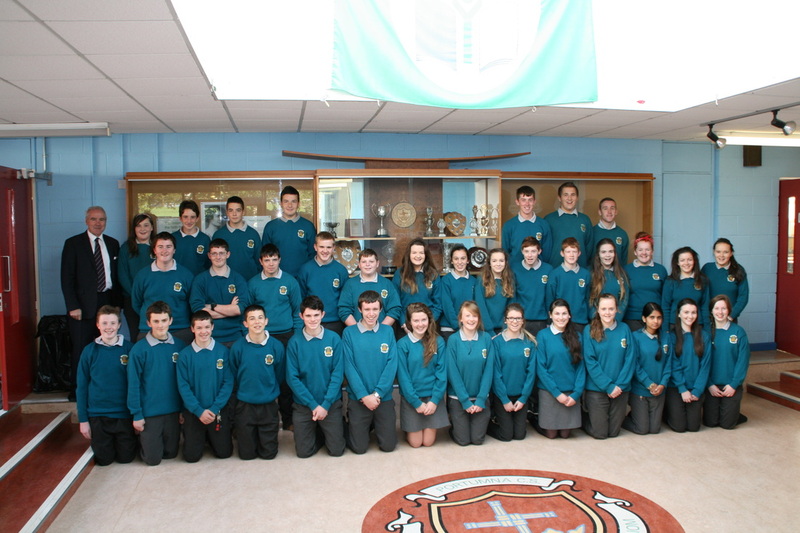 The following students received their Gaisce Bronze awards on Friday May 15th at their Transition Year Graduation. The awardees were: Standing L-R Anita Conroy, Helena Horrigan, Aisling Downey, Clodagh McDonagh, Karen Mullery, Michelle Mitchell, Eimear Walsh, Eoin Gohery, George Harding, Anthony Callagy, David Lynch, Niall Duane, Cathal Quirke, Karl O'Neill, Mark Keane. Kneeling L-R: Evelyn Kennedy, Anna Kelly, Shauna McEvoy, Danielle Devery, Mairead Burke, Roisin Dervan, Emer Donnellan, Keith Scully, Kian Porter and Shane McDonagh. Twenty eight students from Portumna Community School achieved their Bronze Gaisce awards on May 15th at their Graduation Ceremony. James Coughlan facilitated the award for the students during the year and he was delighted with the final result of twenty eight awardees. The award programme was established in 1985 which was international Youth Year, by the Government as a challenge from the president of Ireland to set and pursue personal goals in Community Involvement, Personal Skills, Physical Recreation and an Adventure Journey with the support of an adult leader. Initially the award was piloted in five counties and by 1988, the award was extended to the 26 counties. Since the inception of the awards, over 300.000 young people have benefitted. More and more employers are seeing the benefit of the award to young people and this is acknowledged by a number of awardees who place the award in their C.V's. This year Gaisce celebrates 30 years of community engagement, volunteerism and outstanding achievements by young people. This year over 20,000 students applied for their Gaisce award nationally. The President's Award is about goal setting and the ultimate challenge of competing against oneself. We, in Portumna Community School can account for 28 of these; an amazing achievement by any standards. The commitment and dedication shown by these young people in completing months of physical activities, personal development and in particular community involvement is uplifting and inspirational, and a great example to us all. Our award winners at Portumna Community School between them have dedicated 1,508 hours to Physical Recreation, Personal Development and Community Involvement within their own respective communities. Within their own communities they have invested heavily in community involvement Red Cross, Coaching, Helping out in a Day Care Centre, visiting an elderly neighbour and helping in a charity shop to mention but a few. Learning a musical instrument piano, accordion and guitar were some of the personal skills engaged by the students. For the Physical Recreation; the students took part in Gym work, Rugby, Badminton, Cycling and Clay Pigeon Shooting. It is the one and only National award given by the President, the number one citizen and for that reason it is a most prestigious and valued award sought by students. To the young people who will receive their award, I say to you that by your commitment and effort, you have shown yourselves to be worthy recipients of this prestigious award. I congratulate you and commend your good works in your communities. I would encourage you to take the next award, the silver.